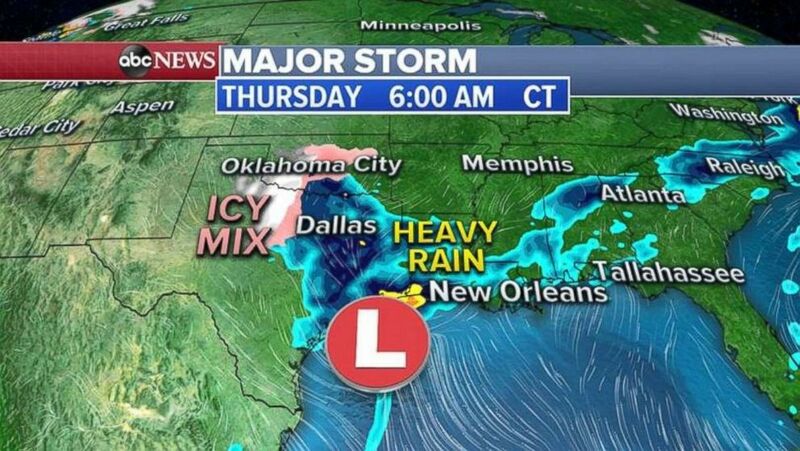 The storm that dumped ice and rain throughout New Mexico and Texas on Wednesday is continuing to move east, pushing into the Gulf Coast. As the storm moves eastward, numerous ice, snow and flood alerts have been issued across the South from Texas to North Carolina. The storm center is centered in the western Gulf Coast Thursday morning and is spreading an icy/snowy mix through northern Texas and into central Oklahoma, where there were numerous spin outs and accidents overnight. Public schools were cancelled for Thursday in Oklahoma City due to the ice. Farther south, heavy rain is falling from Houston to Jackson, Mississippi. The storm is delivering heavy rain to eastern Texas and Louisiana on Thursday morning. 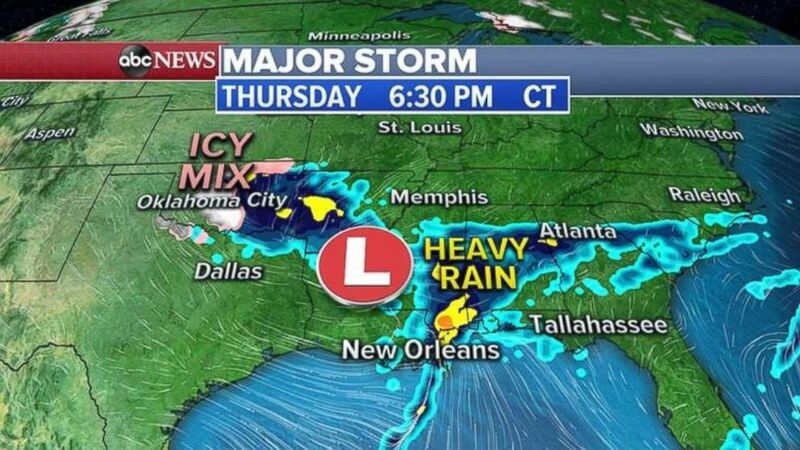 The storm system will move into the lower Mississippi Valley on Thursday night with an icy mix of snow in Oklahoma and northern Texas, and heavy rain spreading from New Orleans to Atlanta. As an icy mix falls in Oklahoma, heavy rain will continue to slide east into Mississippi and Alabama on Thursday evening. 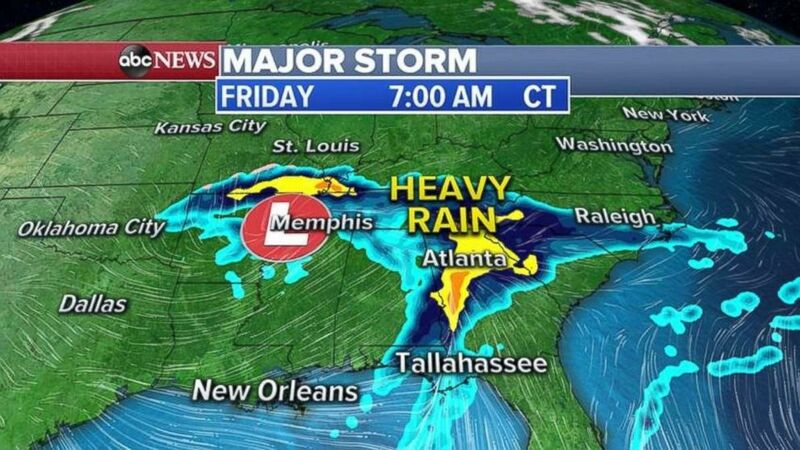 By Friday morning, the center of the storm moves close to Memphis, Tennessee, with heavy rain continuing in Atlanta and parts of the Southeast. An icy mix will finally end in the Southern Plains. Heavy rain moves into Georgia on Friday morning. 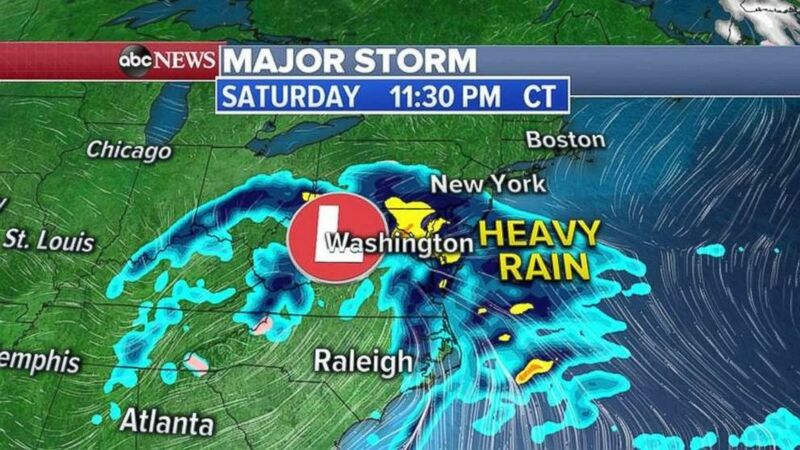 The storm system moves into the mid-Atlantic and the Northeast with heavy rain on Saturday. Flash flooding is possible because the ground is very saturated on the East Coast. Heavy rain will reach the Northeast on Saturday. Some areas in the Southeast could see more than 3 inches of rain over the next few days. And 1 to 2 inches of rain is possible in the Northeast by the weekend. 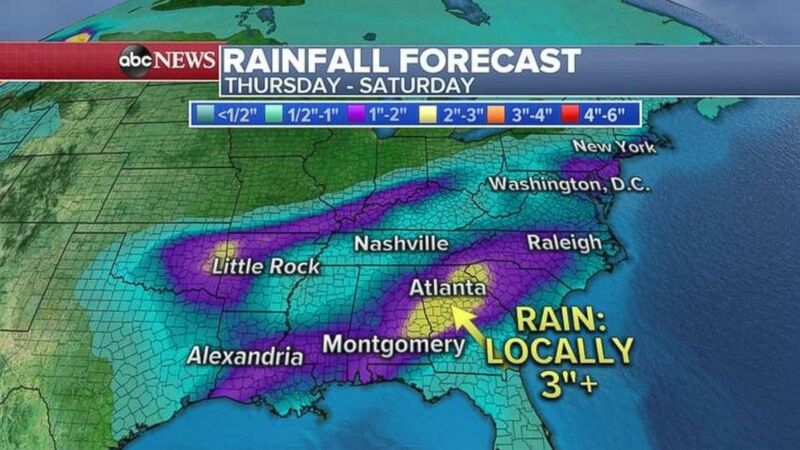 Rainfall totals could be as much as 3 inches locally in central Georgia.